Each year the Honors Program selects a text or texts to be read by all incoming first-year Honors students. The Freshman Reading Project (FRP) promotes community through the common experience of reading and discussing a thought-provoking text. We ask that all incoming students complete the reading assignment before arriving at Baylor in the fall. This year, we are reading How to Think: A Survival Guide for a World at Odds by Alan Jacobs. Dr. Jacobs is a Distinguished Professor of Humanities in The Honors Program and the author of numerous books and publications including a previous freshman reading project book, The Pleasures of Reading in the Age of Distraction (Oxford 2011). 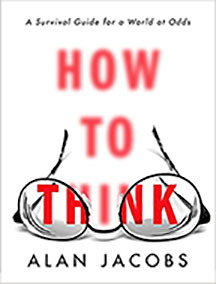 How to Think is a short but effective text that challenges lazy thinking and encourages the reader to think well. The problem he states is that most of us don’t want to think because it can force us out of our familiar, comforting habits. As part of the FRP, new Honors Program students will attend the Honors Freshman Assembly in Miller Chapel on Wednesday, August 29, 7:00-8:30 p.m. This will be your introduction to the Honors Program, and we will begin the formal discussion of our text. We will have the distinct pleasure of hearing from Dr. Alan Jacobs, author of the Freshman Reading Project book and Distinguished Professor of Humanities. In his talk, he will address some of the themes brought forth in his text. Immediately afterwards, we’ll transition outside for some light refreshments and a chance to meet with various staff and other Honors students. On the way out, you will sign up for a small-group discussion of the FRP text. After the small-group discussion (which will be offered at various times throughout the next couple of weeks), you will conclude the FRP by writing a brief critical essay in response to an assigned essay prompt. These essays will be evaluated by the discussion leaders and will be kept on file to serve as the basis for awards occasionally given by the Honors Program. Note: Successful completion of the FRP is required for continuation in the Honors Program. You can purchase How to Think at the Baylor University Bookstore, but the book can also be found at many other traditional and online retailers.